Mechatronics is centered on the disciplines of mechanics, electronics, controls and computers which, when combined make possible the generation of simpler, more economical, reliable and versatile commercial and industrial products. The term was first used in 1969 in Japan, but has become more common in the last twenty years, as traditional mechanical products became increasingly governed by electronic and computer control. It is said that the term 'mechatronics' was invented by a Japanese engineer Tetsura Mori who worked for Yasakava company. Mechatronics is a field of engineering that focuses on the design and production of automated equipment. Mechatronic engineering is an interdisciplinary engineering field which is the combination of computer, electrical, electronics and mechanical engineering that serves the purpose of controlling advanced hybrid systems. In other words, Mechatronics is a branch of engineering that incorporates the ideas of mechanical and electronic engineering into one entity, and in particular cover those areas of engineering concerned with the increasing integration of mechanical, electronic, and software engineering into a production process. It is also called Robotic Science. Mechatronics engineering is an integrated approach to the design of computer controlled electro-mechanical systems. 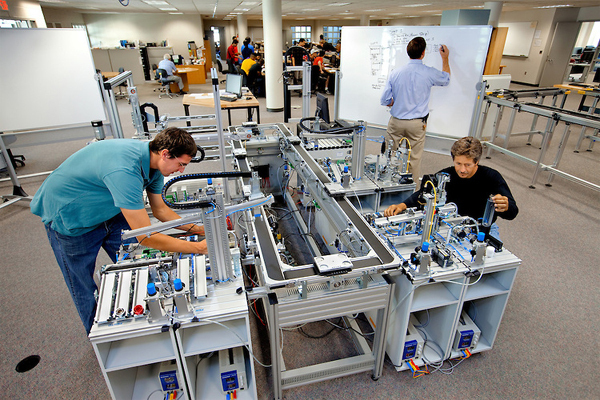 The field of mechatronics integrates the operations, skills and tools of mechanical engineering with those of electrical and computer engineering. It unites the principles of mechanics, electronics and computing, and the end purpose is to design a simpler and more economical system. A typical mechatronic system is characterised by close integration of the mechanical components, electronic sensors, mechanical and electrical actuators and computer controllers. Mechatronics because of its usefulness is now proving to be one of the most functional of the various existing engineering disciplines. A mechatronics graduate can utilize his multiple skills for system designing, and manufacturing the products by incorporating control, electronic and computer devices. Mechatronic engineers design and implement mechanical devices that combine mechanics, software design and electronics. Mechatronics engineers are mechanics, electrical engineers and electronicians all at the same time. A well trained graduate in the field of mechatronics can fulfill all needs of the technical industry. These systems are found in numerous industry sectors where mechanical and electronic engineering are interfaced with computer systems, such as aerospace, automotive, chemical processing, computers, communications, electronics, healthcare, manufacturing and mining. Examples of mechatronic systems are robots, digitally controlled combustion engines, machine tools with self-adaptive tools, contact-free magnetic bearings, automated guided vehicles etc.